Thomas twisted the strands of green grass around his fingers and thought of home. The lush green fields that surrounded the farm where he plied his trade were now just a fond memory. He doubted that he would ever see his mother and father again or his childhood sweetheart, Alice. His enforcement into the king's army had been sudden and unexpected. Although Thomas was a member of the Fyrd for the local landowner, he was shocked when the king's men arrived, recruiting for the coming confrontation with William. Thomas knew that King Harold's army had fought a battle at Stamford Bridge against the Viking king, Harald Hardrada. He knew that the army would be passing close to his hometown, but he thought that they would pass far enough away from the town to prevent any chance of him becoming involved in this war. He still remembered the drawn expression that haunted his father's face. He recalled his mother's tears and Alice's sobbing. He hated kings and he hated their God. They fought their wars with other men's lives, driven only by personal gain. This was bad enough, but then they would back up their selfish insanity by proclaiming that it was God's will. What God, thought Thomas? The same God that allows barbarians blessed with too much power to drag sons away from their families and loved ones. They had marched all day and they sheltered on the outskirts of some woodland he did not know the name of. Most of the other members of the Fyrd were either asleep, or desperately trying to repair their worn footwear. He looked at his own boots and whispered a word of thanks to his father. His father had always maintained that a man needed sturdy and comfortable boots to work the land. He was right, as usual, but the boots also served those who marched to war. He watched the housecarls as they strode around, telling tales of the latest battle at Stamford Bridge. They wore hauberks that provided mail armour to protect them from the swords and arrows of their enemies, whilst Thomas just had a long leather overcoat that only offered protection from the cold. The housecarls had personal swords that were tried and tested in battle, whilst Thomas had an axe that would be better employed to chop wood. Damn all kings and their ambition, he thought. Damn the churches too, and their willingness to take the side of their preferred combatant and bring their God with them. As the light started to fade more rapidly with the onset of the night, he glanced across to a tree where the sound of a young boy coughing drew the attention of some of the housecarls. He had not spoken to the boy and did not know his name but he guessed he was around the same age as he was, sixteen. He watched as one of the housecarls tipped the boys head back and moved the hair from his face. He turned to the others and shook his head. Thomas knew that the shake of the head meant that the boy would probably not survive until the morning. Another soul lost on the march to war before even one drop of blood was spilt. Thomas wrapped the leather overcoat tightly around him to keep out the cold and at least ensure his own survival until morning. Normally, the boy's coughing would have kept Thomas awake but the relentless pace of the day's march caused him to drift into a deep sleep. He was woken by the rough shaking of his arm. He jumped to his feet and reached for his axe, half expecting to be told that they were under attack. Instead, he saw the bearded features of a man in front of him. The man stood a good foot taller than Thomas did, and his muscular build caused Thomas to relax the grip on his axe. "You won't hurt me with that thing, boy," said the man. "Is that all you have brought with you?" "I am not afforded the luxuries that others seem to have," said Thomas. The man stood back, surprised at the sharp comment from the young man. "You are lucky that it was me who woke you," he said. "Most of the others would have dealt you a blow to teach you some respect." "You have to earn respect," said Thomas. "So, you have no respect for any man here, simply because you do not know them?" asked the man. "You have this the wrong way round. You should respect your fellow man until he shows himself to be unworthy of it." "Then we disagree about that," said Thomas. Thomas looked into the man's blue eyes that burned with anger. His long blond hair hung around his face as his mouth formed into a snarl. "I need your help with the boy over there," he snapped. "I had thought that you might like to aid me, but then if you did not know the boy." He frowned, shaking his head at Thomas, before turning away angrily and walking off. The guilt overwhelmed Thomas and he ran after the man. The man stopped and turned to look at Thomas. "I will help you," said Thomas. The man stared at Thomas for a second or two before walking back towards him. "I want you to know that I only need your help. I don't need your respect," he said. Thomas could not look him in the eyes and instead looked to the floor. "Kauko?" asked Thomas. "What is that?" "It is a man's name," said the man. "What is yours?" "Thomas," said Thomas. "I have never heard of anyone called Kauko before." "In all your many years and great travels you have never heard the name Kauko?" asked Kauko. Thomas recognised sarcasm when he heard it and immediately tried to justify his statement. "I know I am young and I may not have the experience that you have, but Kauko is an unusual name is it not?" asked Thomas. "Because he's a Viking spy," said a voice from behind Kauko. Thomas watched as a thickset man walked towards them. He had dark brown hair and a ginger beard. "Well, are you going to sort the boy out or just let him rot on that tree?" asked Alfred. "I was just getting some help as the others seem to not be interested," said Kauko. "I don't care how you do it, but get on with it. It will be morning soon and we march at first light," said Alfred. "It will be done," said Kauko. Alfred moved nearer to Thomas and grabbed him by the shoulders, forcing him to stand straight. "Whatever you do, boy, don't bend over in front of this one. Do you know what I am saying?" he asked. He slapped Thomas on the arm and laughed. "Be gentle with him," he scoffed at Kauko, as he walked away. "Ignore him," said Kauko to Thomas. "I can assure you that I am not that way inclined." Thomas smiled nervously at Kauko and followed him to where the boy lay still against the tree. At least you have found peace, thought Thomas. Kauko grabbed the dead boy and slung him over his shoulder. "Over by the small fire, you will find two shovels. Bring them with you," said Kauko. They found a spot between the trees where they buried the boy. Kauko knelt by the grave in a moment of silence. He looked up when he realised that Thomas was still stood leaning on his shovel. "I'm not religious," said Thomas, offering a quick explanation for his state. "Neither am I, but...oh, I forgot your rules of respect differ to mine," said Kauko. Thomas was humbled by the retort and knelt by the side of the grave. Kauko was silent for what seemed like forever to Thomas before eventually getting to his feet. Kauko rubbed his forehead and spoke to his helper. "You will see many men fall before the battle is over. Some of them will be murderers, rapists, thieves and killers for hire. Some of them will be good men, frightened men, boys like you, but all of them will be someone's son. You should look at your rules of respect and make them a little more versatile," said Kauko. "Come with me. Let's go to the fire and get you something decent to eat. Most of the others will be asleep and those that are not will be either too tired or too drunk to protest at your presence." Thomas followed Kauko to the fire and ate the meat that Kauko handed to him nervously, wary lest any of the other housecarls should voice their anger. He need not have worried. Those that were still awake either did not notice or did not care about Thomas sharing their food, or they were simply too scared of Kauko to say anything. "Is it the blond hair?" asked Thomas. Kauko frowned at Thomas, silently waiting for an explanation of the question. "The reason that man called you a Viking spy. Is it the blond hair?" asked Thomas. "That and the Viking name. I suppose I brought it upon myself really," said Kauko. "So, if you are not a Viking, why do you have a Viking name?" asked Thomas. "In the battle at Stamford Bridge, I asked a man I killed what his name was, just before he died," said Kauko. "Why would you ask his name?" asked Thomas. "The fighting was nearly done and we found ourselves facing each other. For the only time in the battle I fought against a single foe," said Kauko. "I knew he must be a fearsome warrior to have survived so long. I was right, he fought long and hard and had he not slipped during the fight he may well have got the better of me. I asked his name because I wanted to know the name of the man who fought so bravely. He told me it was Kauko. I took his name as a mark of respect." Kauko stood up and stared at the skies. "It's funny how the subject of respect keeps occurring isn't it?" he asked Thomas. Thomas stood up with Kauko and pointed towards the sky. "Before I came here, before I left my home, I saw the shooting star pass across the sky," said Thomas. "My father said it was a sign of bad times, a great evil. I guess he was right. He's always right." "Why do you say that?" asked Kauko. "That the shooting star portends evil. Maybe it brought something good." "Is that what you think?" asked Thomas. "It's what I like to think," said Kauko, smiling. "I hope you are right," said Thomas. "I like your view better." Kauko placed a hand on the shoulder of Thomas. "Get some sleep. We march again tomorrow," said Kauko. "Even if I have not yet passed your requirements for respect yet, you have mine, Thomas." "You have mine too," said Thomas. "I relaxed the rules a little." The next morning, Thomas was woken by the sound of men shouting. When he looked over to where the men were, he could see Kauko standing toe to toe with another man. At first, Thomas thought he should go and aid Kauko, but he quickly realised that a menial member of the Fyrd might well lose his life by having the impertinence to interfere with the affairs of the housecarls. "He's a bloody Viking. Look at him. Look at his hair. He's called Kauko, for God's sake," shouted the man. "If I were a Viking spy then I would have already killed you in your sleep, you fat oaf," said Kauko. The man escaped the restraining grasp of his comrades and lurched towards Kauko, who squashed the man's nose with the back of his hand. The man fell to the floor and squealed. Kauko did not attempt to follow up the blow, instead choosing to turn and pick up a drink from the floor. Alfred appeared, pushing the men away and standing over the man on the floor. "And what are you, a pig? Stop the squealing man and get up. Bloody mercenaries," said Alfred. Alfred stood in front of the men and addressed them in a loud, authoritative voice. "The only man allowed to call Kauko a Viking spy is me. That is because I do not mean it. It's a bloody joke. Is that clear or should we consult with the King on the matter?" he asked. Some of the men mumbled in dissatisfaction and some of them laughed, but all of them knew that it was best not to argue with a Lord. "Now pick the squealer up and get ready to march," said Alfred. Alfred walked over to Kauko and shared a drink with him. "What sort of bloody idiot calls himself by a foreign name?" asked Alfred. "A big one?" asked Kauko. Alfred laughed and threw his drink to the floor. "Great backhand by the way," said Alfred, walking away. Thomas ran to Kauko as the men dispersed. "Do they all think you're a spy?" asked Thomas. "Most of them," said Kauko. Kauko looked around and saw that he and Thomas were more or less alone. "Quick, come with me. I have something for you," said Kauko. Thomas followed him to the place where Kauko had obviously slept at night. Kauko knelt by a large sheet and pulled a gleaming sword and a hauberk from underneath it. He gave them to Thomas who just stared at Kauko in silent gratitude. "Wear the hauberk under your overcoat. We don't want the other housecarls asking where you got it. If they ask about the sword, tell them you found it in the woods where we buried the boy," said Kauko. "In the woods?" asked Thomas. "Yeah, that's not very good is it?" said Kauko. "Okay, tell them I found the sword in the woods and I gave it to you. If that doesn't shut them up, tell them to come and see me." "That will work," said Thomas. "Thank you." The march to Caldbec Hill proved to be a gruelling affair for Thomas. With every step that he took, his boots seemed to wear thinner, despite the fact that when he paused to check on their condition they seemed fine. Thomas came to the conclusion that it was his feet that were wearing out and not his shoes. It was not only Thomas who was finding the trek hard going, some of the older men seemed as though they had fought one campaign too many. Thomas would pass many of the older members of the Fyrd as they stopped to take off their boots and massage their feet. Once they had relieved the pain in their feet a little, they would run to catch up with their comrades, leaving themselves out of breath. Thomas wondered how this collection of tired men, housecarls and mercenaries could possibly win a battle. He could only hope that William's men were even more tired. The weight of the hauberk and the sword did not help Thomas in his movement, but he was aware that this was a small price to pay for such added protection. When they reached Caldbec Hill, they began the slow trudge to the top. The last thing any man wanted after a long march was a climb up to the top of the hill, but this was where the king intended to set up camp, and so the men gritted their teeth and slowly ascended the obstacle in front of them. Thomas reached the hill well before most of the men and took the chance to lie down on the soft grass and get his breath back. As he lay on his back, shielding his eyes from the sun, the shadow of a man stood over him. "What kept you?" asked Kauko. "My aching feet and burning lungs," said Thomas. "Well, you'll be pleased to know that this is where we intend to stay and fight," said Kauko. "We'll set up the shield wall on the hill." Thomas suddenly realised that he had no idea what to do when the battle began. "What do I do?" asked Thomas. "You have no shield, so you must stand behind the shield wall. When we move into formation, make sure that you stand behind me," said Kauko. "I will protect you as best I can, but make sure you make good use of that sword." Thomas was confused, why would a man he barely knew be so interested in his welfare. "Why do you want to help me?" asked Thomas. "Perhaps you are more important than you know, Thomas," said Kauko. "I'm not a King or a Lord. I'm no servant of God or a wealthy landowner," said Thomas. "And if any of those things were important in this world, I would see your point, but such things do not matter," said Kauko. "It is the possibility of men or women to shape the future for the better that carries more weight." "So, you think I am destined to become a Lord or maybe even king?" asked Thomas. Kauko laughed and sat down on the grass next to Thomas. "Do you ever listen to a word I say?" asked Kauko. "Forget Lords and Kings. Forget wealth and forget the excuse of carrying out God's will. Just remember who you are and what you believe." "I don't know what I believe," said Thomas. "I don't believe in what we're doing here today and I don't believe in God. My mother would clip my ear when I told her so, but as much as I loved her, I think her beliefs are mistaken." "Don't tell any of the men here that, Thomas. They are praying that God will save them," said Kauko. "I have more faith in my sword." "I was listening to some of the men whilst we were marching," said Thomas. "They said that God wanted Harold to win. They say it's their destiny to win this battle. They say the shooting star was a sign." Kauko shook his head and stared at the ground. "Destiny and fate. How men grasp at such things. There is no such thing as fate or destiny. Each man's course can change in a second. An infinite number of possibilities await him, governed by chance and decision. All we can do is try to steer in the direction that we want to go," said Kauko. "Is that what you're going to do in the battle?" asked Thomas. "Steer your ship?" "No," said Kauko. "That's not why I am here. I am here to steer your ship." Thomas leant on the grass with one elbow and stared at Kauko. "Like I said, Thomas, you are more important than you think," said Kauko. "So, you're like my guardian Angel?" asked Thomas. "There are no Angels, Thomas," said Kauko. "Even if there were, I doubt that I would be one." The day was spent setting up camp as more men arrived in small groups. Thomas was instructed by the senior members of the Fyrd to help assemble the camp. It was a task that he did not mind at all. It was far easier than the boring march to Caldbec Hill had been. As night started to fall, some of the men split into small groups and began to pray. Thomas wondered what he should do. He certainly did not want to kneel before a God he did not believe in. He kept out of the way of the others and found himself a less crowded spot to sit, surrounded by boys of a similar age to him, who looked equally as indecisive. All Thomas wanted to do was return home. If he could have run away from all this, right now, he would have done, but he knew that he would probably not get far, and even if he did, the consequences for his family would not be welcome. He lay on his side and just hoped that he could survive the battle, regardless of the outcome, and return home. As the moon rose in the sky, he could see the tall, blond haired man move to the edge of the hill. What is Kauko up to now, he thought? He got to his feet and made his way past the others on the hill, silently tracking the movement of Kauko. When Kauko stopped and kneeled, his head tilted towards the sky, Thomas stopped at a safe distance and observed his new friend. Kauko started to chant in a language that Thomas had never heard before. Perhaps, he really is a Viking, thought Thomas. What if he is here to avenge Harald Haraldsen's defeat? What if he is here to sabotage King Harold's defences and help William to win the battle? For some reason, Thomas felt that this was not the case. Why would a saboteur give a young boy a hauberk and a sword? Why would he befriend him? Perhaps, Kauko intended to keep Thomas alive so that he could tell the English how the mighty Viking, Kauko, avenged his king's defeat. Thomas hoped that this was not the case, not least because Kauko was the only friend he had here. When Kauko stopped chanting and got to his feet, Thomas scurried away, back to the other boys. As he lay in the grass, watching the clouds pass by the moon, he saw Kauko walking towards him. Suddenly, Thomas began to panic. Had Kauko seen Thomas watching him? Was his friend walking over here to silence him? Thomas placed one hand on his sword as Kauko sat beside him. "You can take your hand off your sword," said Kauko. "There is no one here for you to fight yet." Thomas screwed his nose up and took his hand from the sword. It was as if Kauko had second sight. "Can I ask you something?" asked Thomas. "If you like," said Kauko. "Are you from here?" asked Thomas. "I've already told you, I am not a Viking," said Kauko. "That's not what I asked," said Thomas. "I should have known how perceptive you would be," said Kauko. "No, I am not from these lands, but do not tell the others." "You said you were not religious, but I saw you kneeling at the edge of the hill," said Thomas. "I heard you chanting in a different language. Where are you from?" "From somewhere far away from here. A place so far away that you would not understand," said Kauko. "I doubt that you would even believe me." "I might," said Thomas. "Try me." Kauko rubbed his chin and shook his head. "It is not for you to concern yourself with. All you need to know is that I am not your enemy," said Kauko. "No, you're my guardian non-Angel," said Thomas. "But you were praying." "No, not praying," said Kauko. "I was using words from my homeland to give me strength." "Not asking for help from God?" asked Thomas. "If there was a God, do you think that men would be ripped from their families, waiting at the top of a hill to die?" asked Kauko. "Do you think that a just God would have taken you from your family to fight another man's war?" "Maybe he's just a God. Maybe, he just wants things his way and he does not care about us," said Thomas. "And maybe, he just does not exist," said Kauko. As they sat together, Alfred came running towards them. Kauko sprung to his feet, concerned at Alfred's haste. "What is it?" asked Kauko. "You're not going to believe this, but the king intends us to fight in the morning," said Alfred. "That's madness," said Kauko. "Some of these men can barely stand." "William is already on his way and will be in position at the bottom of the hill by morning," said Alfred. "Then we hold the position with the shield wall, but take the day for rest," said Kauko. "That's not what the king wants," said Alfred. "Be ready for the morning." Alfred walked away and Kauko sat back down on the grass. "The madness continues," he said. Before Thomas went to sleep that night, he hoped that when he woke this all turned out to be a bad dream and that he would wake up to see the faces of his mother and father standing over him and urging him to get to work. Thomas knew that the bad dream was all too real, though. Morning came with the shouts of men and the sound of metal clanging against shields as they hurriedly tried to prepare themselves. Thomas jumped to his feet and watched as the men started to form the shield wall on the top of the hill. He wondered whether, in all the excitement and confusion, he could manage to slip away quietly down the other side of the hill. Surely, they would think he had died in the battle if they did not see him leave? He edged away from the others, making a careful bid for freedom before the hand on his shoulder stopped him. "You would not get far. They have men, mercenaries, who are tasked with the job of executing all deserters," said Kauko. Thomas looked around and could see the scarred face of a man watching him, his hand resting lightly on his sword. Thomas realised that this man was more practised than him in the art of quiet observation and movement, and sighed. Kauko smiled at Thomas and beckoned him to follow as he walked back to the main group. "You should not worry," said Kauko. "I will not let anything happen to you. You will see your mother and father again, I promise." Thomas wished that he had as much faith in Kauko as Kauko did, but the sight at the bottom of the hill made him believe that these were just hollow words from Kauko. The shield wall had lined up in such a way that it seemed impenetrable, but Thomas looked to one side of the wall and saw the massed troops of William's armies approaching. "He's already here," gasped Thomas. "He has wasted no time. I suspect that he wants to get this battle started whilst his men still have the stomach for the fight," said Kauko. "King Harold will feel the same." Thomas could see the men on the horses and the archers who were quickly forming into mass ranks behind the rest of the army. "They have horses and archers, what chance do we stand against them?" asked Thomas. "I do not intend to save all of the men today, just you," said Kauko. "Now do as I say and do not falter." Thomas followed as Kauko took his position in the wall. Kauko pulled Thomas tight in behind him. Thomas could not see much because the huge frame of Kauko blocked much of his vision, but as they began to walk down the hill, he could occasionally see William's men advancing towards them. They stopped in a position about halfway up the hill and the men started to shout and chant. If this was meant to intimidate the men at the bottom of the hill, it did not appear to work. William's men emitted what seemed like a roar to Thomas, and then a group of them started to sing. "What are they singing?" asked Thomas. "How do I know, I am not a Norman? I am a Viking, remember?" asked Kauko, without turning around to look at Thomas. When the men crouched behind their shields and Kauko instructed him to get down, Thomas knew that something bad was coming. The hiss of arrows through the air was quickly followed by the sound of them clattering against the shields. Occasionally, one would find its way through the smallest of gaps and find the flesh of a man. Thomas watched as those that were unlucky enough to be found by an arrow fell to the floor, clutching at the wound or staring lifelessly into space. He saw as the mercenary who had been watching him at the top of the hill, took an arrow to the shoulder. To his amazement, the man pulled the arrow from his shoulder and held his position behind the wall. Thomas was so glad that it was Kauko who had prevented him from fleeing and not this man. Despite the arrows, the shield wall held firm, causing William's men to advance up the hill towards the Saxon army. As they climbed the hill, a volley of stones and rocks came raining down upon them, hurled by the men of the Fyrd standing securely behind the shield wall. Thomas was amazed that such a primitive method of attack could cause such carnage amongst the ranks of a modern army. The defenceless men were scattered by the storm of rocks descending upon them, and they began to run back down the hill in retreat. Upon seeing this, William ordered his cavalry to charge. The cavalry closed the gap between themselves and Harold's men quickly, their horses too fast for the random rocks coming from the skies. The horsemen lowered their spears and thrust them into the shield wall, but once more, the wall remained solid and unbreakable. Men and horses fell as they were impaled on the spears of the shield wall, their cruel points extending beyond the boundary of the wall. As the cavalry turned and fled back down the hill, some of Harold's men broke ranks and ran after them. "We've got them, they're running," shouted Thomas. He ran around Kauko and went to follow the others. The promise of a return home was within his grasp. William's men were broken and scattered. The battle was over before it had barely begun and the drug of triumph filled his senses. The smack of a hard armoured glove hit him full in the face, sending him to the floor dazed and shocked. As he tried to get to his feet, the same armoured glove reached out to help him. It was Kauko. "You bloody hit me," said Thomas. "Why did you hit me?" Kauko pulled Thomas to his feet and pointed to the chasing pack. "Watch and you will see," said Kauko. Thomas struggled to break free from the grasp of Kauko, but Kauko's grip was too strong. "Let me go. They are done," said Thomas. "Let's finish this." "They were done, but stupid men have given them a second chance," said Kauko. Thomas saw that the men were already on top of William's men, realising far too late that they were now fewer in number and lacked the protection of the wall. As the cavalry spun around and regrouped, the men tried to get back up the hill. Tired feet and aching limbs were no match for the swiftness and agility of a horse, however, and one by one, they were cut down and left to bleed their lives away beneath the hooves of the horses. "We have to help them," screamed Thomas. "We can't just leave them to die." "We have no choice," said Kauko. "If we run to their aid, we will be cut down as well." The screams of the dying men soon turned into an eerie quiet, punctuated only by the soft crying and moaning of the fallen. Thomas fell to his haunches and held his head in his hands. Kauko crouched beside Thomas and placed a hand on his shoulder. "When it happens again, make sure that you do not follow them. You can see why now," said Kauko. Thomas nodded his head and got to his feet. As he looked around, he could see that far from grieving for their fallen comrades, the men took the opportunity to drink and eat. He looked down the hill and saw that the cavalry had returned to the rest of its army, and William's men were taking refreshment as well. "What the hell is wrong with them?" muttered Thomas. "It is a natural break in the battle," said Kauko. "Call it protocol. You should eat and drink as well. You will need all your strength." Thomas felt unclean at the thought of taking a break for food after witnessing the slaughter of men who had been telling tales of their homes the night before. Nevertheless, he joined in with the others, never taking his eyes from the floor in silent guilt. When he had finished, he followed Kauko as he retook his position in the shield wall. The calm and the silence were broken by the thundering sound of horses' hooves running towards them. This time, the rest of William's army followed behind the cavalry. The shield wall held firm and the spears that found horses and men once more caused a Norman retreat down the hill. 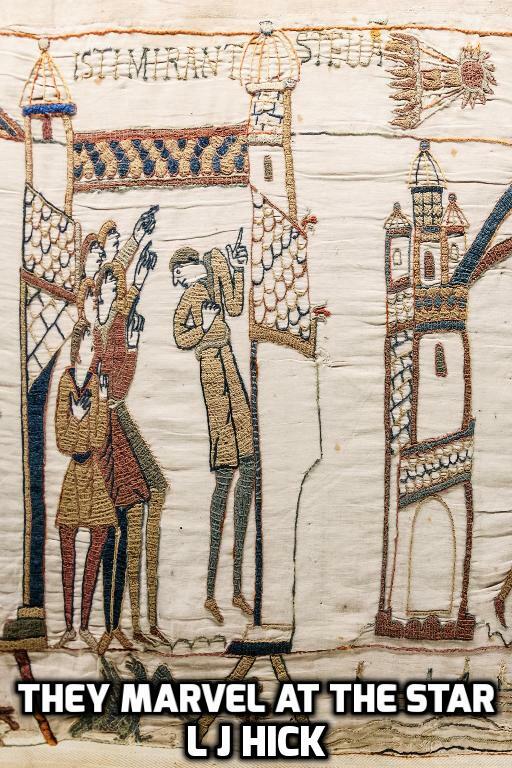 This time, the shield wall broke completely as all the men chased after the fleeing Normans, convinced that finally, William was defeated and the battle was at an end. "Here we go again," whispered Kauko. Thomas remembered Kauko's words and stayed where he was. He watched as the cavalry turned and regrouped again. William's men followed the cavalry as they hacked and sliced their way through the Norman army. It suddenly occurred to Thomas why the hail of arrows had stopped. He saw the archers advancing up the hill behind the others, retrieving their own arrows as the line advanced. They gathered sufficient numbers to fire over the heads of their own men into the Saxon ranks. Kauko pulled Thomas down behind his shield. The combination of cavalry, foot soldiers and arrows tore apart the Saxon army. As William's men broke through, Kauko sprang into action, killing three men before Thomas had time to draw his sword. He turned around just in time to see a burly man running at him. Thomas thrust his sword as best he could and the momentum of the running man carried him onto the blade. As he looked into the man's eyes, he could see the surprise and shock on his face. Thomas kicked the man in the chest to free his sword and watched as he fell to the ground. Once more, the armoured glove found him and dragged him away. Thomas was still in shock and could barely move his feet, but Kauko literally dragged him through the mud and blood to the back of the battle. Still, the Saxon army fought bravely as the Normans advanced but the cry from the top of the hill finally broke their resistance. "The King is dead," yelled the voice. Kauko rushed to the scene to find Alfred hunched over the dead body of King Harold. Alfred looked up at Kauko. "I couldn't save him. He took an arrow to the chest and then some kid of a Norman found his heart with his sword," said Alfred. "I turned to fight him but he was killed by one of his own arrows. Bloody things just kept coming. One even found the King's eye." "Come with us. This is over," said Kauko. "I am a Saxon. I will die rather than flee," said Alfred, angrily. As he spoke, a line of men charged through the soldiers and one of them thrust his sword into Alfred's back. Thomas reacted but the man punched him in the face, sending him into a semi-conscious world. As he lay there, looking at the sky through a foggy haze, he could see the man's sword raised above him. So now, he would never return home, never see his mother and father again. His head swum as the man's head disappeared from his body. He felt himself being lifted by the arms of another and carried away from the battle. His head swirled as he raced past the bodies of dead men. The last thing he saw were the trees before his world turned black. Thomas could hear the voices of men speaking softly as he regained consciousness. He was thankful to be alive, but too bruised and dazed to open his eyes. Instead of making an effort to get to his feet, he decided to keep still and wait for the ringing in his ears to stop. As he lay there and his hearing began to clear, he could hear the voice of Kauko. "Did you do as I asked?" Kauko asked the other men. "We did," one of the men replied. "We dug the ditch as you suggested and we filled it with wooden stakes, sharpened to a point." Thomas opened his eyes and rolled onto his side to look at Kauko's new friends. There were a dozen men, Saxons by the look of them. Thomas noted how clean the men looked, other than for the mud on their boots and trousers. Not one of these men had been involved in the battle. He wondered whether Kauko had stumbled upon a group of deserters and sought sanctuary for himself and Thomas. Kauko slapped one of the men on the shoulder and smiled at him. "You and your men have done well, Alwin. You have my thanks," said Kauko. "There is no need for your thanks. You paid us generously," replied Alwin. Alwin was a tall thin man. His long hair and unshaven state partly obscured the diagonal scar on his face. This was not a deserter; this was a man who had fought in many battles. Whatever fear he had of war had left him long ago. Kauko had referred to the others as your men, so his friends were probably every bit as hardened in battle as Alwin, but if that was the case, what were they doing here? As Thomas shuffled around to get more comfortable, Alwin watched him out of the corner of his eye. "The boy is awake," said Alwin. Kauko ran over to Thomas and knelt down beside him. Thomas flinched as Kauko examined the cut on Thomas's forehead. "It's okay," said Kauko. "You have your first battle scar. It will be a little sore for a while, but that's all." "Who are these men?" asked Thomas. "Are they friends of yours?" "I would not call them friends. They are more like temporary employees," said Kauko. "They did not fight, did they?" asked Thomas. "No, I paid them to wait here for us and make some preparations," said Kauko. "Preparations for what?" asked Thomas. "One last fight," said Kauko. "The Normans are not done with us yet." "We're not safe here?" asked Thomas. "We have no horses and they are mopping up what is left of the Saxon army. They will see our tracks and send a group of riders after us," said Kauko. "That is why we are prepared." "So you plan to wait and fight them with your employees?" asked Thomas. "After we have thinned their numbers out a little," said Kauko. "Is that what the ditch is for?" asked Thomas. Kauko smiled and pulled Thomas to his feet. "You have been awake longer than we thought," said Kauko. "Yes, that is what the ditch is for." Kauko and Thomas walked over to the ditch, whilst Alwin and his men took some time to rest, eat and drink. The ditch was obscured by a lining of leaves, carefully spread across a supporting net to hide the cruel wooden stakes underneath. Thomas thought that given the width and length of the ditch, Alwin and his men must have been here well before the battle, preparing it. The leaves merged with the leaves on the forest floor in such a way that Thomas could not be sure where the ditch ended and the forest floor began. Only a very close inspection would uncover the strands of netting staked to the edge of the ditch. "Come. Let's get something to eat," said Kauko. "You must be hungry." Thomas sat with Kauko and the others, hungrily devouring the bread that was on offer. As he looked around, he noticed that two of the men were missing. "Where are the others?" asked Thomas. Alwin spun around and screwed his face up at Thomas. "When I woke there were twelve of you. Now there are only ten," said Thomas. "Where are the other two? "Do you miss nothing?" asked Alwin, sighing. "I am beginning to understand why you are so important to our friend here." "It's more than that," said Kauko. "The other two are on watch," said Alwin. "We need eyes in the trees to warn of us of a Norman approach. Unless, of course, you can tell us when that will be." "Really?" asked a smiling Alwin. "And when might that be?" "Round about now," said Kauko, nonchalantly chewing on a slice of bread. As he spoke, the two men came running through the trees. "Normans," one of the men shouted. "Arm yourselves." Alwin and his men jumped to their feet and took their positions on one side of the ditch, whilst Kauko took Thomas to the rear of the group. The sound of the horses' hooves became louder together with the sound of men bellowing instructions to each other. Thomas felt he should be at the front, helping the others, but he knew from experience that it would be futile to try to escape the grasp of Kauko. If Thomas was troubled by his enforced impotency on the battleground, there was not much time for him to ponder on it as the mounted Normans came crashing through the trees. Alwin and his men formed a similar shield wall to the Saxon army that fought on the hill. The first line of the cavalry urged their horses on as they caught sight of their prey. Their intimidating cries turned to screams as the ground gave way beneath the horses. Men and horses writhed in agony as the merciless racks of stakes tore their flesh apart. Those behind their fallen comrades tried to turn and avoid this pit of death, but most of them were too late. They crashed into each other and fell over the bodies of the fallen. Those who survived were left incapacitated by their wounds, struggling to free themselves from this deep trench of death. Some of the men charging from the rear were wily enough to avoid the fate of the front ranks, however, and they turned their steeds sharply to run around the pit and attack Alwin and his men. Alwin and his men stood firm as the remaining Normans circled around them. Alwin counted just six riders and their horses as they attacked them. The remaining horsemen were no match for the shield wall. The long sharp spears of the wall found the flesh of the horses and it was only when the last man fell from his wounded mount that the shield wall broke and Alwin and his men put the Normans to the sword. As Alwin and his men finished off the last Norman, they failed to see the man climbing out of the pit. Knowing that he was doomed, the Norman raised his sword and charged at the first Saxon he saw, Thomas. Thomas knew that he was surely going to die this time, but the Norman's sword found the flesh of the man who pushed Thomas aside so that he could take the fatal blow. "No!" screamed Thomas as Kauko fell in front of him. He grabbed the sword that had fallen from Kauko's hand and plunged it deep into the Norman's chest. He stared at the dying man as he dropped to the floor, his strength driven by anger and grief. The others rushed to aid the stricken Saxon and his young charge, but Thomas was already cradling his dying friend in his arms. "Why? Why did you do that?" he shouted angrily at Kauko. Kauko just smiled as he breathed unsteadily. "It is what I am meant to do," said Kauko. "You knew this would happen," said Thomas. "It was a high probability," smiled Kauko. Kauko gasped for air and turned towards Alwin, beckoning him towards him with a finger. "Have you suffered any casualties?" he asked. "Not one," said Alwin. "Although our shirts and trousers have seen better days." "You and your men must return Thomas to his home. My time is done here, so I trust you to complete the task," said Kauko. "It will be done. Do not worry," said Alwin. Kauko breathed deeply and turned his head back towards Thomas. "Are you actually a Viking?" asked Thomas. "Then where are you from. I know you are not from this land," said Thomas. "My name means far away. Does that answer your question?" asked Kauko. "But what land?" asked Thomas. "Somewhere you have never heard of. Somewhere you would not believe," said Kauko. "Now listen to me. When William becomes King, all men will have two names. Your first name, then a second name to distinguish you better from others. What will your name be, Thomas?" Thomas wiped away the tears streaming down his cheeks and thought hard to think of a name, but none came to mind. Thomas held his friend close and then it came to him. "Deorwine," said Thomas. "It means dear friend. It will always remind me of you." Kauko smiled and lifted his arm slowly to place a hand on Thomas's shoulder. "It is as I was told. Over seven centuries from now, a descendant of yours shall be born. He will shine a light on the origin of man. Man is not governed by gods or mapped by fate, he is free. Millions of different choices to determine the future. A future not shackled in chains," said Kauko. "Deorwine. I like it. You have made a good choice. Of course, names will change over time and Deorwine will become Darwin. Now go home and marry your sweetheart, because the line of Deorwine must continue." "What? How do you know all of this?" asked Thomas. "Perhaps, I can explain in another time," said Kauko. "After all, we shall meet again in all probability." "What do you mean? Kauko? Kauko?" asked Thomas. He shook his friend, but it made no difference. Kauko's lifeless eyes stared up at the stars. Thomas shook with grief and sobbed uncontrollably as he held his friend. Alwin knelt by the side of Thomas and held his arm lightly. "Let him go, Thomas," said Alwin. "Let him go." They buried Kauko in a single grave, well away from the pit of death, amongst a marvellous cascade of flowers. Some of the men said a prayer for Kauko, but Thomas did not object, realising that all men sought solace in the face of mortality. As the men paid their respects, Thomas saw that Alwin had moved away from the rest of the group and was staring at the night sky. Thomas walked slowly over to Alwin and stood by his side. Alwin spoke as Thomas stood next to him, but did not turn his gaze from the sky. "He came to us on the night that the star appeared," said Alwin. "The shooting star?" asked Thomas. "It shone so brightly in the sky and when it passed, there he was stood right in front of us, as if from nowhere," said Alwin. "He said he had a task for us. He said he needed to steer a ship." "He meant me," whispered Thomas. "I think so," said Alwin. As they spoke, a flash of light ripped across the sky, illuminating the night. "It's the star. It has returned," said Thomas, pointing up at the sky. "No it's not the same," said Alwin. "It burns brighter and it travels the opposite way to the last one." "We should give it a name as well," said Thomas. "I think it already has a name," said Alwin, smiling. "Kauko," said Alwin, as they both marvelled at the star.